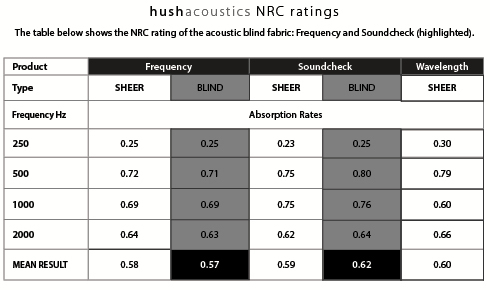 “Hush Acoustic Sheers absorb significantly more sound energy than any other sheer fabric that I know of. In contemporary decors where hard surfaces are preferred, these acoustic sheers are an ideal way to introduce desperately needed, unobtrusive and highly effective sound absorption”. David Spargo, owner of Praxis Acoustics. You’ll hardly believe the huge difference a simple sheer fabric can make to the acoustic amenity of a room. Our range of Hush Acoustics – Sheer Drapery & Sheer Blind Fabric – are lightweight, translucent, acoustic textiles; a combination that was previously unavailable for commercial spaces. Hush Acoustics Sheer Drapery Fabric comes in three different patterns – Soundcheck, Frequency & Wavelength – and are all in a simple, neutral colour palette. They have the added advantage of being woven at 330cm wide, making the fabrics perfect for installations where large windows are a feature. Hush Acoustics Sheer Blind Fabric is the same lightweight, Acoustic Solution that will help with the reverberation within a space, yet offers a modern, low profile option. It consists of two different patterns – Frequency Blind & Soundcheck Blind. 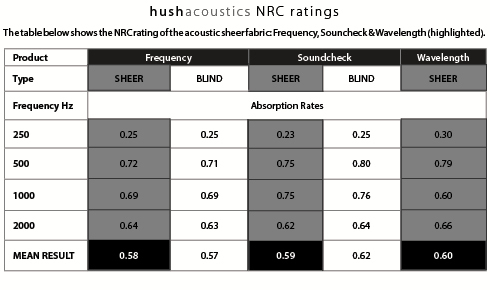 To quantify our fabrics as commercial acoustic solutions, each is tested and awarded an NRC (Noise Reduction Coefficient) rating.The NRC relates to the absorption effectiveness of the material, and is calculated by averaging how absorptive a material is at 4 different frequencies: 250hz, 500hz, 1000hz and 2000hz.Taking this average number, it is then applied it to the NRC scale of 0 to 1. A perfectly sound absorptive material achieves a 1, whereas a 0 indicates no absorption. With the fabric positioned approximately 15 to 20cm from the window or wall, researchers found that it could absorb up to five times as much sound as a typical lightweight fabric. At low frequencies, around 200hz, it absorbed no more than about a fifth of the incidental sound energy. However, at frequencies of about 500hz (human ears have a maximum sensitivity between about 3000-4000hz), the fabric absorbed about three quarters of the incidental sound energy. Not looking for Sheers? View our Hush Acoustics – Light Reduction / Opaque Drapery Fabric. Watch the videos below to hear the amazing effects of these fabrics in a commercial space.